As mobile technological devices and their owners increasingly spend every waking minute together, they both eventually seem to exude a certain mated-for-life aura. So, exactly how far-fetched is the likelihood of genuinely falling in love with one’s companion-gadget? In the not so distant future of Spike Jonze’s Her, set in Los Angeles, the possibility is not so far-fetched at all. 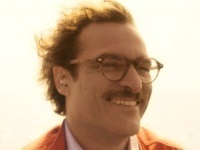 In fact, Theodore Twombly (Joaquin Phoenix) has truly fallen in love with Samantha, a computer operating system that’s part disembodied Venusian beauty and affection, and part Uranian high-tech and artificial intelligence. Voiced by Scarlett Johansson, Samantha is the real deal. And, for most of Her, Jonze explores the question of what “real” actually is and how much of it humans can handle. Theodore, a sensitive, introverted soul who’s in the process of getting divorced from his wife (Rooney Mara), earns a living writing emotional and heartfelt letters for clients who can’t tap into their feeling natures. He’s got a solid best friend (Amy Adams) and a good buddy at work (Chris Pratt). But he spends most of his time with his Neptunian ideal of a gal pal Samantha who’s part virtual assistant, intellectual soul mate, caring friend, brainiac, social instigator and sexual partner. The twist here is that Samantha’s not a static guide, but rather a piece of artificial plasma that’s constantly evolving, throaty voice and all. It’s an egalitarian, Uranian-inspired union, despite her binary quality. Sounds good, right? Theodore’s coming out of his shell through the love of a good digital fembot. However, if in the temporal universe people move on to continue on their paths and growth trajectories, why would a relationship like Theodore’s and Samantha’s be any different? If anyone figured that romantic partnering up in the digital stratosphere would simplify intimately connecting, Jonze would strongly disagree. In this game, whoever changes first and the fastest holds the winning cards, no matter how much idealized (Neptune) love (Venus) of technology (Uranus) is professed. Love in the future may offer short circuits, but no short cuts.